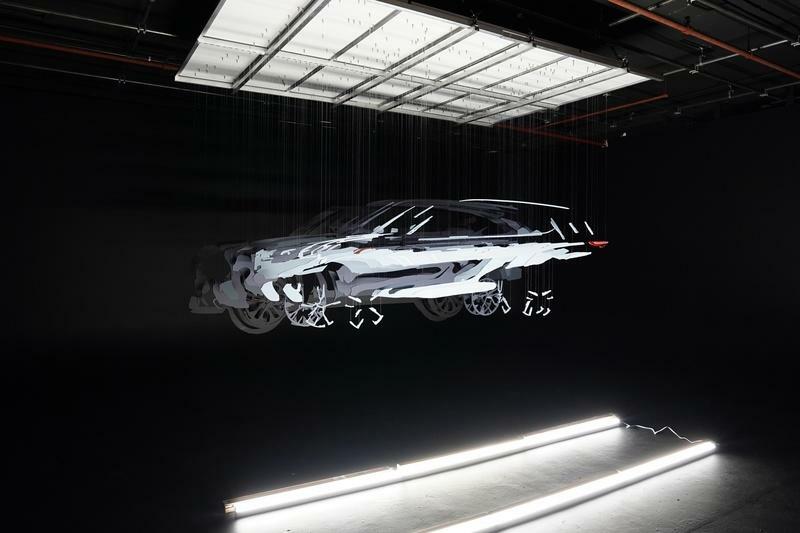 While we have yet to see the 2020 Toyota Highlander in its full auto-show glory, we do have a rough idea what it’ll look like thanks to the above teaser video. Hit play, and you’ll see the Toyota’s profile rendered through a hanging art piece. 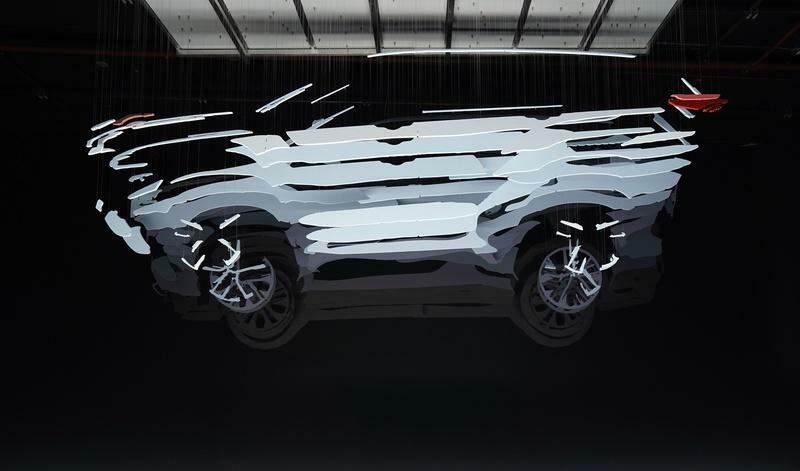 The piece was created by artist Michael Murphy over the course of two months and recreates the new SUV by overlaying image-slices in a back-to-back fashion, creating a composite image. 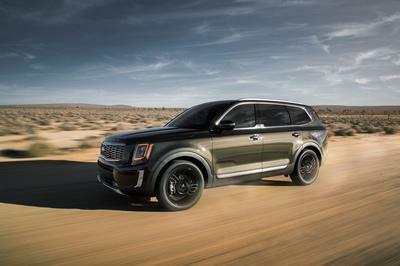 Viewed from the right angle, the new SUV seems to come into focus. 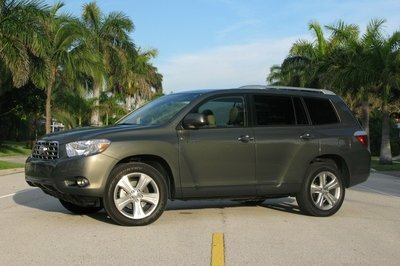 Generally speaking, the new model looks similar to the outgoing model, but there are a few styling updates to pick out. 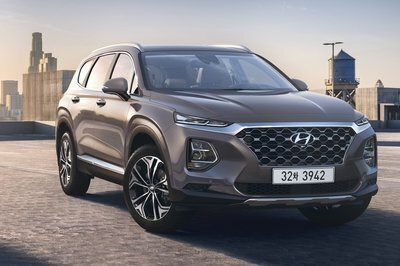 The first thing that jumps to our attention is the window line, which rises more sharply as it approaches the tail, giving the SUV a more rakish stance. The side character lines also appear more pronounced, complementing the new window line, while the roofline is now more sloped. The front overhang also appears to be shorter, while the rear overhang is a bit longer. 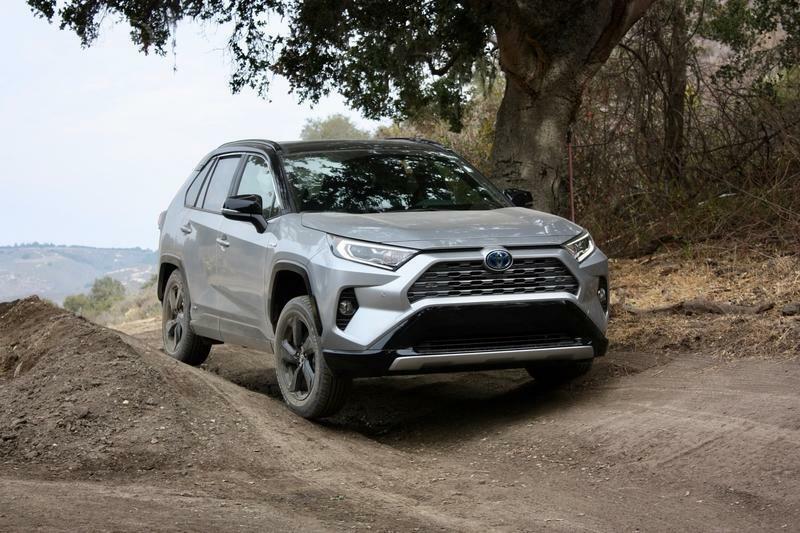 Up front, we expect the 2020 Highlander to take after the recently released 2020 RAV4, which rocks a Tacoma-esque front end that helps to underline the vehicle’s off-road aspirations. 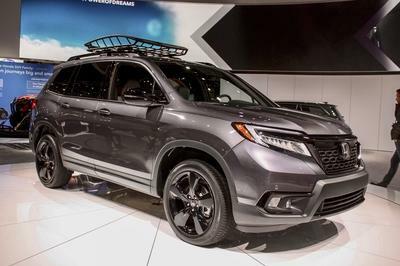 On the Highlander, that should translate as new headlight housings that are thicker and more angled than those on the outgoing model, as well as a new grille divided into a hexagonal upper intake and a slim lower intake. Also look for a set of boxy wheel arches in the corners, with dark black plastic undercladding to protect the paint. 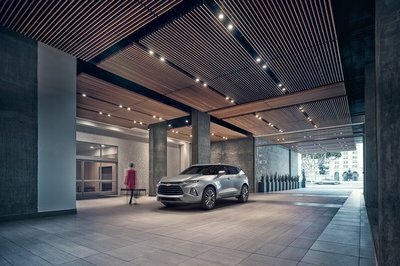 Dimensionally speaking, the 2020 Toyota Highlander will remain a mid-size model, but it’s likely the exact measurements will grow slightly with this latest update, which will help with both cargo room and passenger room. For your reference, we’ve listed the current third-generation Highlander’s exterior dimensions below. What Will the Cabin Look Like? Moving inside the cabin, we expect the new Highlander to once again pull from the latest RAV4 in terms of look and layout, which will not only keep it feeling fresh and modern, but also stay consistent with the rest of the Toyota brand. That should include a new dash, which will move the touchscreen higher to a “standup” position above the center console. 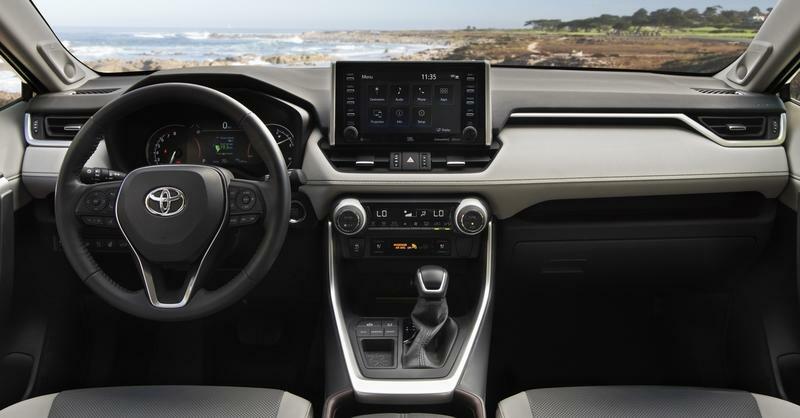 The current Highlander is equipped with a 6.1-inch screen as standard and offers an 8.0-inch unit on the options list, but we could see a 7.0-inch touchscreen added as standard across the line, similar to the 2020 Toyota RAV4. Further infotainment upgrades will include Apple CarPlay support as standard. Although Toyota has resisted the inclusion of Apple CarPlay for years, it looks like the automaker is finally bending to consumer demand and adding it across its lineup. Additional features, like a blind-spot monitor with rear-cross traffic alert, will likely be optional. Toyota is a leader when it comes to standard safety tech, and this will surely continue with the latest 2020 Highlander. 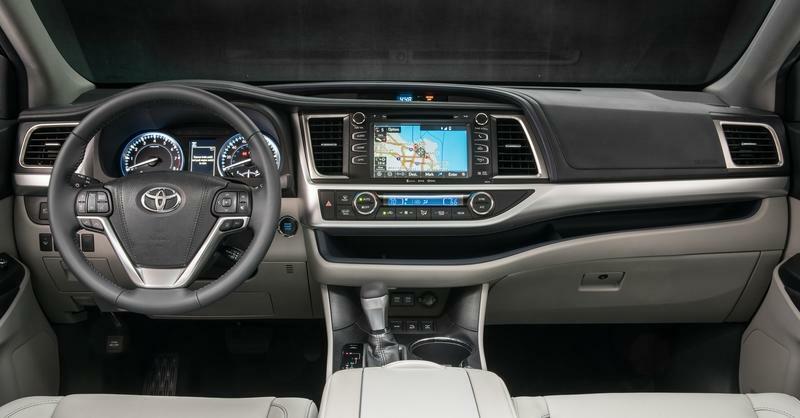 Behind the front seats, the 2020 Toyota Highlander will fulfill its promise of practicality with three-row seating and space for up to eight passengers. Note: 2019 Toyota Highlander pictured here. 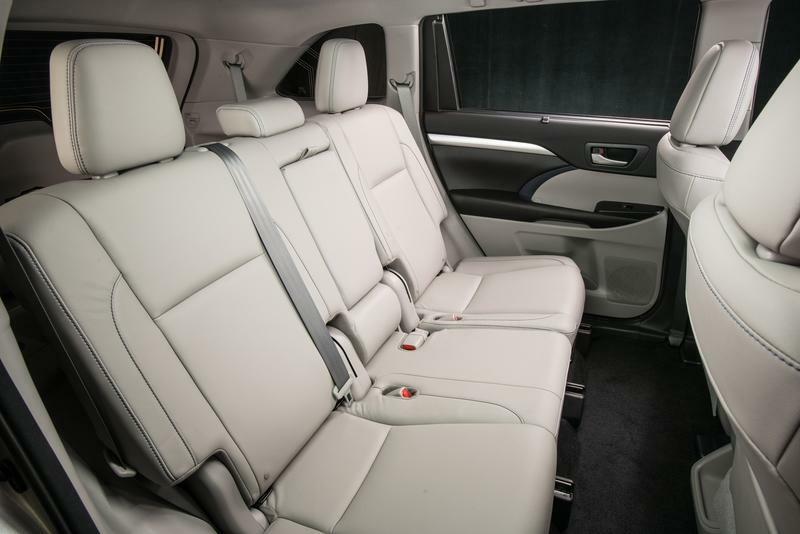 For now, the Highlander offers 61.7 cubic-feet, 52.8 cubic-feet, and 30.4 cubic-feet of passenger room for the first-, second-, and third-rows, respectively. Thanks to slightly larger exterior dimensions, we expect each of those volumes to grow accordingly. The same goes for the cargo volume, which is currently rated at 83.7 cubic-feet, 42.3 cubic-feet, and 13.8 cubic-feet behind the first-, second-, and third-row, respectively. For your reference, we’ve put together a table of capacities that compares the current 2019 Highlander with its main rivals below. What About All The Oily Bits? 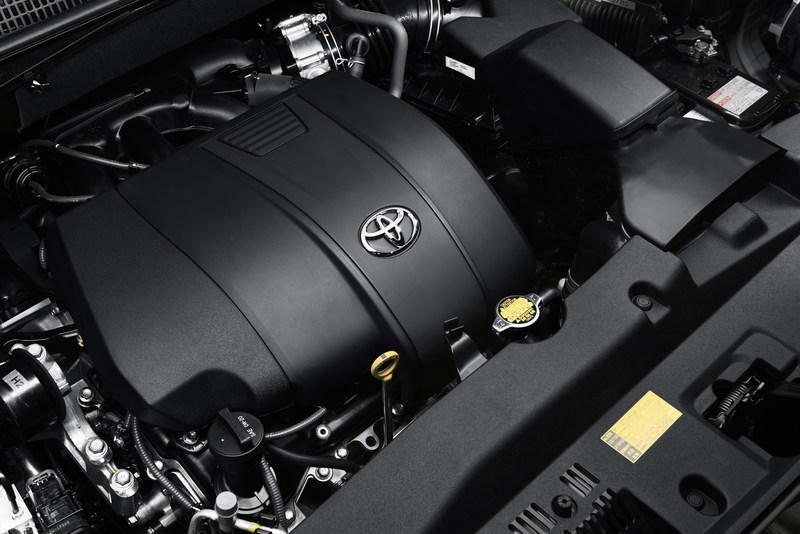 Currently, the mid-range Toyota Highlander is equipped with a 3.5-liter V-6 that produces 295 horsepower and 263 pound-feet of torque. However, heading into the 2020 model year, we expect the ‘six to get a small output boost up to 301 horsepower and 267 pound-feet of torque, just like the V-6 spec in the latest Toyota Camry. For those of you keeping score, that’s a net gain of 6 more ponies and 4 pound-feet over the outgoing Highlander. Lower in the range, the Highlander comes with a 2.7-liter four-cylinder producing 185 horsepower and 184 pound-feet of torque. Once again, we expect a power boost for the 2020 model year, but something far more significant than that of the ‘six. We can once again look to the Camry for clues here, specifically the sedan’s latest 2.5-liter four-cylinder, which produces as much as 206 horsepower and 186 pound-feet of torque. If this lump makes it into the Highlander unchanged, that’ll be a net gain of 21 ponies and 1 pound-foot. Both gas engines will mate exclusively to an eight-speed automatic transmission. 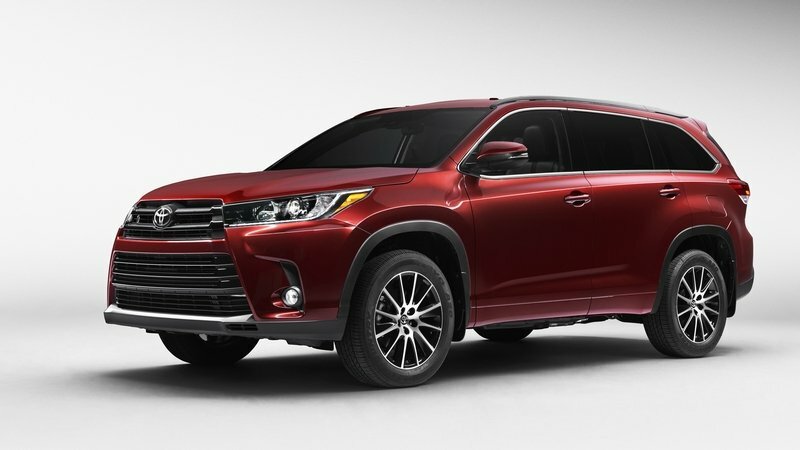 Toyota currently offers the base-level Highlander with a six-speed automatic, but that option will likely hit the dustbin with the outgoing 2.7-liter engine option. The 2020 Toyota Highlander will also return with a number of hybrid powertrain options, including both a traditional hybrid and a plug-in hybrid. For now, Toyota offers the Highlander with a 3.5-liter V-6 hybrid making 306 horsepower, and that’s likely to remain unchanged going into the 2020 model year. 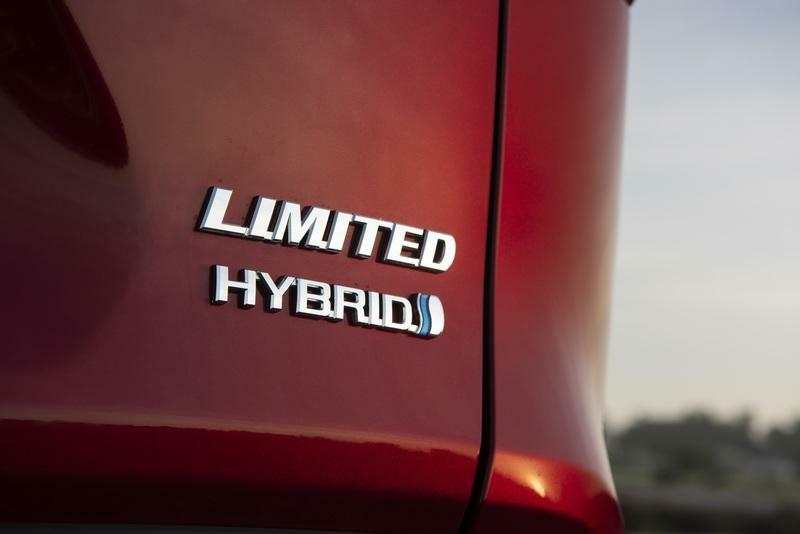 However, Toyota might also add a complementary plug-in four-cylinder to the lineup for even greater efficiency. If that turns out to be the case, it won’t be all that surprising - Toyota is determined to expand its electrified offerings over the next few decades, and that extends to its range of SUVs as well. 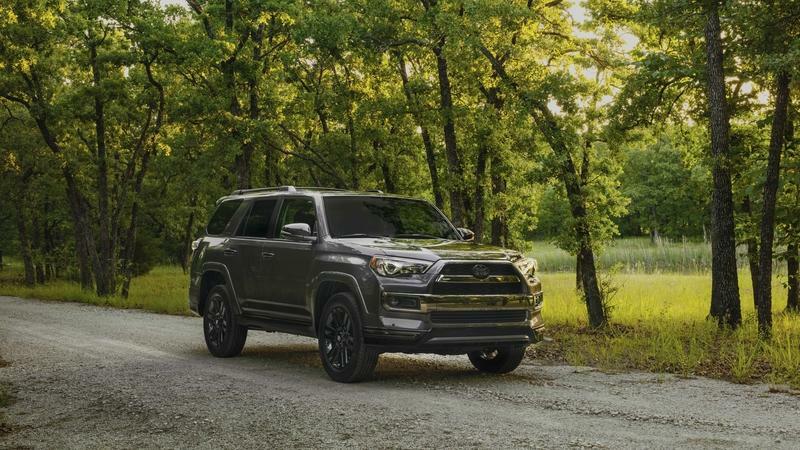 However, if you prefer a little extra aggression over green sensibilities, Toyota will once again offer the Highlander in a sportier SE trim level, which will come with that 3.5-liter V-6, a more aggressive suspension tune, and a few performance-flavored bits and bobs for the interior and exterior. Across the line, front-wheel drive will be standard, while all-wheel drive will be an available option. Under the skin, the Highlander will be based on the latest Toyota New Global Architecture, offering up lower weight and greater torsional rigidity. The 2020 Toyota Highlander is scheduled to make its formal debut at the 2019 New York Auto Show next week, at which time we’ll get a full rundown on specs and features. If you want one for your garage, look for it in dealers by the end of the year. Pricing is so far unannounced, but we expect a small bump over the 2019 model year’s starting MSRP of $31,530. Are you excited for the new 2020 Toyota Highlander? Let us know your thoughts in the comments section below.